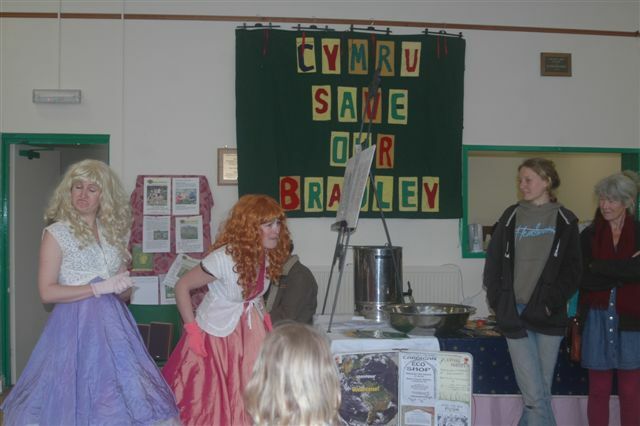 Green fair with Bradley cafe, display boards and performers attracted hundreds of people from his county in Wales. In the evening speakers and bands with political message inspired and got everyone dancing. Speakers said it could take a few years to get Bradley free but our county is used to campaigns short and long (many over 10 years) and to winning them against huge odds. This is the biggest. Chris May described his long dialogue with Chuck, a senior marine who had attacked the Bradley Manning campaign in virulent terms! It was a long respectful thoughtful email dialogue. Chris made a very silent hall re-think about how they handle right wing opponants. By the end Chuck thanked Chris for taking the time to discuss and said this had made him reconsider. 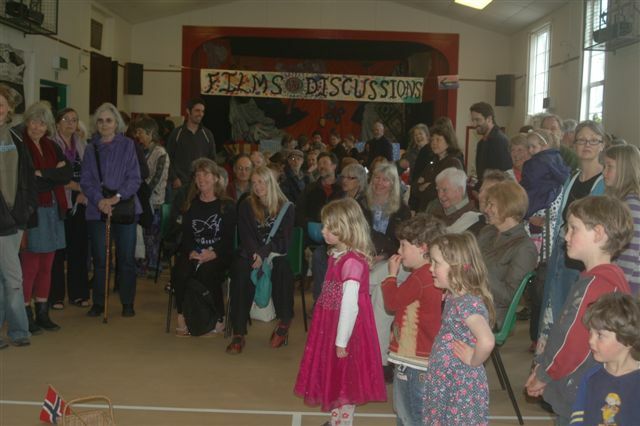 Families enjoyed the discussions and comedy – U.S. apple pie direct action, young people enjoyed the evening’s bands. Regime were the best political band! Nearly everyone danced and shared details to keep in touch with Bradley. The move to Leavenworth was seen as a success for the first goal of the campaign. Journalists will tour the facility on Thursday 28th to see how Bradley will be kept, in a total reversal of policy – inviting in public scrutiny instead of a tower of angry silence. The gathering heard that the family of Bradley both sides of the water appreciated our campaigning and its effectiveness. Bradley would thank us in person when he gets out! The display boards on Bradley were read through the day. Tonight the UN raporteur on torture condemned U.S. for not allowing him an official visit, he has been trying since December and as I write signatures are pouring in to the Avaaz petition from around the world. It is sobering to see. The petition started on 8th with an ambition of 250,000 signatures but 3 days later, today the 11th there are over 400,000. Have a look and sign. Just to clarify his opinion, Ellsberg said, “It may seem like I’m critical of Obama here, and God knows I am, but I voted for him. If he needed my vote in 2012, he would have it again in a minute based on the candidates on the other side.” He then described his views on the other potential candidates. “Mike Huckabee wants to execute Bradley Manning,” he said, “and Sarah Palin advocates for hunting down Assange like Obama Bin Laden, to which Assange says, ‘Good, that’ll give me ten more years. '” Rather than following Palin’s advice, Ellsberg concluded his talk by advising the audience to hunt the truth instead. 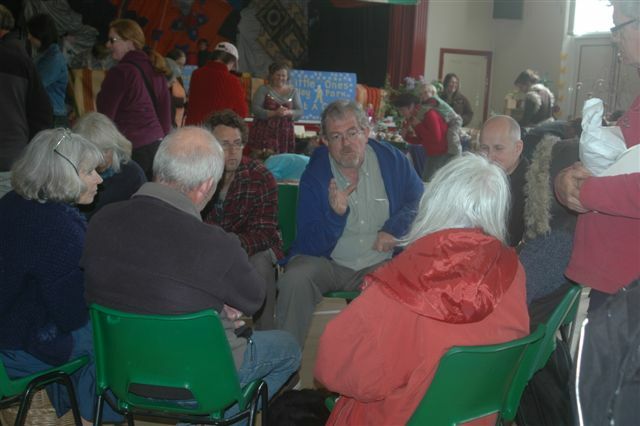 Two meetings happened monday 4 April, one in Pembrokeshire, one in Parliament. In Pembrokeshire Bradley supporters met with his aunty, uncle and mother and heard how they had been ‘left in the dark’ about him, how a meeting was arranged where Bradley’s mother could touch him but when she arrived after thousands of miles travel she was turned away. When she finally got to meet him last month through glass, she just wanted to hug him and touch him and saw how he was affected by his imprisonment by his constant nervous twisting and turning. ‘He was like a different person.’ Her sister and brother in law who were told they could visit him before they left Wales, were refused at the door. The group heard other troubling news. 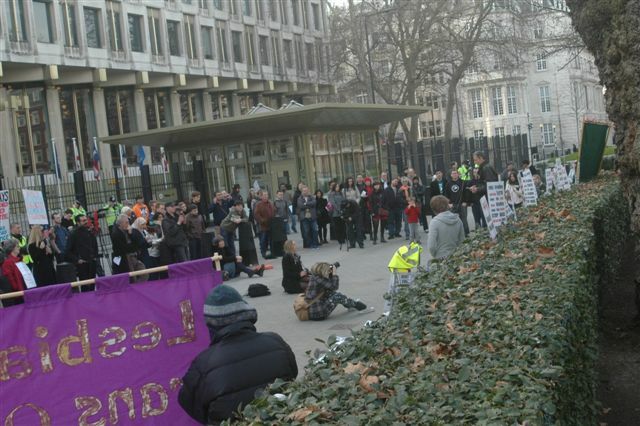 Leading a short debate on 4 April 2011, Ms Clwyd, a former special envoy on human rights to Iraq, told MPs that Private Manning was being held in solitary confinement for 23 hours a day at the Marine Corps brig in Quantico, Virginia. He had complained of being stripped at night, with guards asking him whether he is “okay” every five minutes, she told MPs. These conditions served “no purpose other than to humiliate and degrade Bradley Manning”, Ms Clwyd concluded. She warned that the soldier’s treatment – and the UK’s response to it – could undermine the “moral authority” needed to influence “countries where human rights are not so well observed”. Responding to the debate, Foreign Office Minister Henry Bellingham said British diplomats will express MPs’ concerns with officials in Washington. Mr Bellingham said that staff at the British embassy in Washington had already discussed Bradley Manning’s detention with the US State Department once. (Bradley) has now been charged with aiding the enemy, a crime which can bring the death penalty or life imprisonment. The American Civil Liberties Union, Amnesty International, Human Rights Watch, and many other human rights organizations have denounced the conditions in which Manning is being held as tantamount to torture. Amnesty International and other groups have implored the British government to intervene in the case. A few voices from within the political establishment have expressed concern over the potential for popular backlash against the torture of Bradley Manning. Expressing this concern, State Department spokesman P.J. Crowley last month characterized the government’s treatment of the soldier as “ridiculous and counterproductive and stupid.” He was forced to resign almost immediately after the remark, made during a question-and-answer session to an audience of 20 at the Massachusetts Institute of Technology. 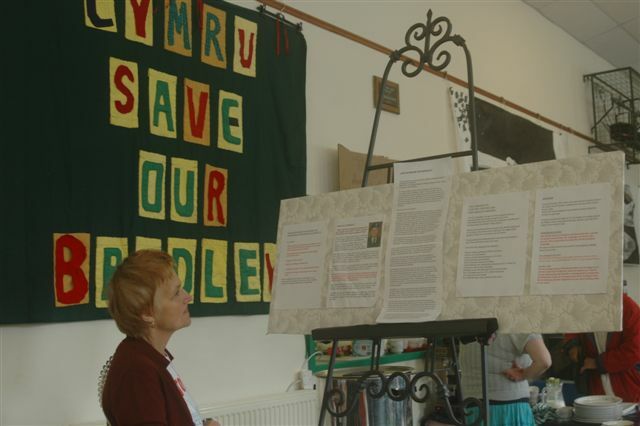 “We the young people of Pembrokeshire have always been encouraged to tell the truth and fight for what we believe in. 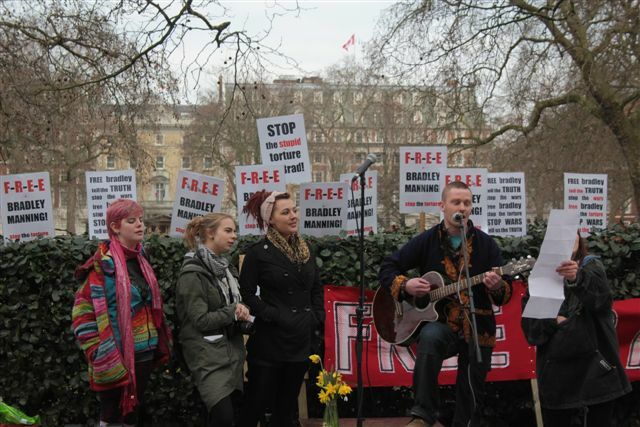 100 gathered outside U.S. embassy, one of 30 demonstrations of support for Bradley accross the world on that day.